I’m returning from the largest Sandals and Beaches event in Central and Northern Florida. I learned so much and experienced an instrumental marketing forum about what’s new at Sandals and Beaches Resorts. I couldn’t wait to share it with you. What else is included? Tips, gratuities, hotel taxes, and transfers. Can you believe it? Keep reading. It gets better! Sandals has 16 restaurants per resort. That means you have your choice from a variety of restaurants at no additional charge. If you plan on staying for 4 nights, you might want to extend your stay so you can explore all the different cuisines. Your choice includes a variety from Asian, Sushi, Thai, Japanese Teppanyaki, West Indian, Jamaican, Bahamian, Contemporary Caribbean, Mediterranean, Italian (Ma Ma Mia). Are you getting hungry yet? What about trying seafood, international, brick-oven pizza, classic french, British Pub fare, fusion, gelato & pastries, or even something light and healthy. Food for even the pickiest palate. I don’t know about you, but I sure could use this kind of treatment. 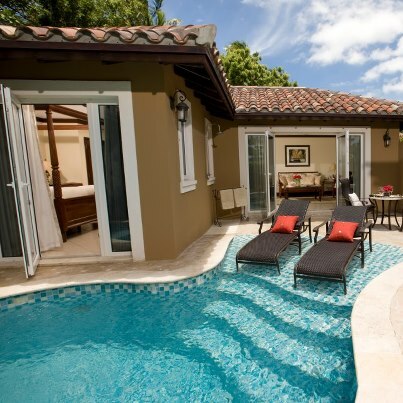 Let’s step outside for a minute to see what adventures Sandals offers at no additional charge. If you are a certified diver, diving up to twice a day is included, with guided dives from 20-90 feet, on state of the art Newton Dive Boats, Luxter or Catalina tanks, Silicone masks and snorkel, and Deep Blue fins. This is a PADI-certified resort dive program with PADI and DAN representation on site. Dive suits can be rented and there are underwater camera and video services available for a nominal fee. Not certified? No problem! Sandals offers a resort certification course (nominal fee applies), which will have you experiencing dives up to 30 feet. Talk about viewing a whole new world. Hmmm. I might have to look into this. YOLO (You Only Live Once)! 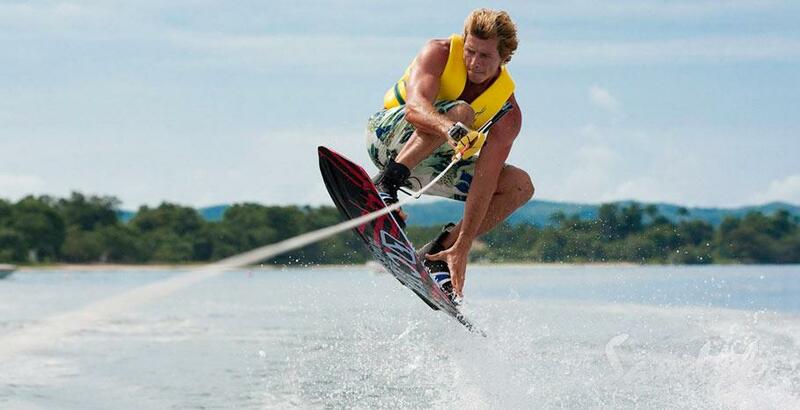 What other water sports can you participate in with top of the line equipment and professional instruction at no additional charge? It’s tee time. Again, at no additional charge. 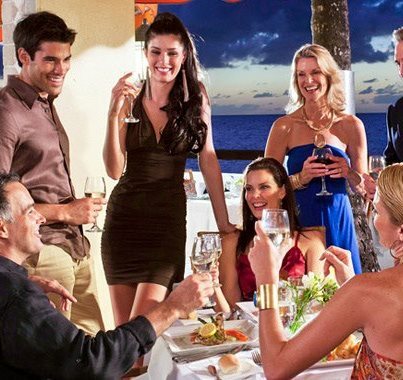 Sandals resorts include exclusive gold and unlimited play and complimentary green fees. Ocho Rios (Sandals Golf and Country Club), has an 18-hole championship course. Or how about the 18-hole oceanfront course designed by Greg Norman at Sandals Emerald? Why not try the Reef Golf Club at Sandals Emerald Bay, which was named one of the best golf courses in the Caribbean by Travel & Leisure Golf. If you’re staying at the Sandals Regency La Toc, you’ll want to try the 9-hole Executive Course. Here are additional things to remember if you are golfing with Sandals. Golf is included in Jamaica and St Lucia. Caddies are mandatory but are not included in Jamaica and St Lucia. Golf carts and club rentals are not included. Greens fees are additional at Sandals Emerald Bay in the Bahamas. Golf is not included in Antigua, but it is available nearby. 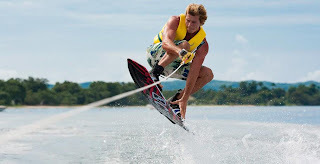 Other outside land activities include: tennis (private lessons available), racquetball and squash ball, lawn games, table tennis, beach volleyball, basketball, fitness centers with trainers, billiards, shuffleboard, and indoor pub games. Top-shelf drinks are available at no extra charge, available 24/7, and are served everywhere throughout the resort. 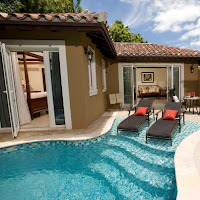 Sandals continues to raise the bar when it comes to the luxury included experience for guests. They’ve partnered with Beringer to offer the perfect wines for the beach or dinner. Sandals definitely includes everything you need for a perfect worry-free vacation or honeymoon. So what are you waiting for? Get in touch with me today! Ask me about Beaches Resort. The family friendly get-away resort...perfect for family reunions or holiday get togethers. When’s the last time you visited a Sandals or Beaches Resort?